More than 100 billion events have been detected by the Large Area Telescope on Fermi after 616 days in orbit. That is a lot of events. The Large Area Telescope detects gamma-rays, one at a time, at a rate of a few per second. We measure where each one comes from and use this information to build up a deeper and deeper picture of the gamma-ray sky. However for each gamma-ray, we detect over one thousand cosmic-rays – charged particles moving at close to the speed of light. We call each cosmic-ray or gamma-ray detected by the LAT an event. We don’t send the data from all events down to the ground. We are primarily interested in the gamma-rays so we run software onboard the Large Area Telescope to identify and delete events that are clearly cosmic-rays. This reduces the rate of events from 4000 per second to around 400 per second. This allows us to make better use of the precious data transfer connection between the observatory and the ground. Once we get the data down to the ground, we use a large computer farm (>1000 machines) to process the data carefully and pick out the real gamma rays, which arrive a few per second. Lots and lots of gamma rays! Compared with previous gamma-ray telescopes the LAT detects gamma-rays at a far greater rate. The plot shows the number of gamma-rays detected by four previous gamma-ray telescopes over their operating lifetime compared to the number of gamma-rays detected by LAT in a single year. 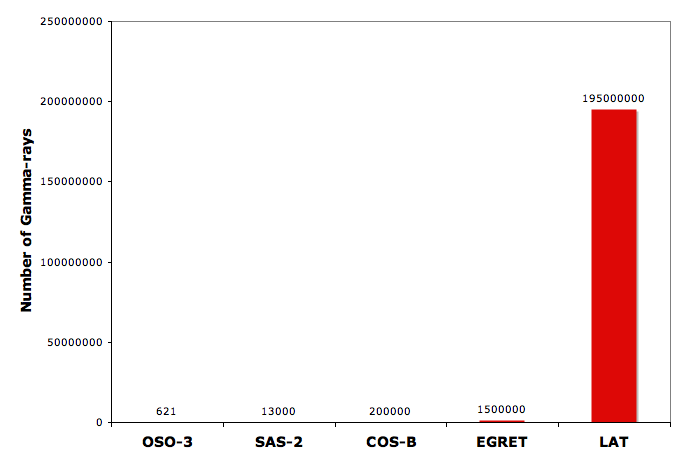 There are so many gamma-rays detected by LAT that you can barely see that any are detected by the previous missions (OSO-3, SAS-2, COS-B and EGRET). The enhanced ability of LAT to detect gamma-rays so efficiently is one of the reasons that Fermi is such a ground-breaking mission. A full year of sky survey observations! One year ago today, Fermi started sky survey observations after completing observatory and instrument commissioning ahead of schedule. The previous entry described our first light results. Since then, we have discovered new populations of pulsars in our Galaxy. We have observed a extraordinary gamma-ray burst, which was the most powerful explosion in the Universe ever seen. We have explored the properties of the diffuse gamma-ray radiation, which permeates the Milky Way. We see the the Sun, the Moon and the Earth shining in high energy gamma-rays. Our continuous monitoring of the high-energy gamma-ray sky has uncovered numerous outbursts powered by supermassive black holes at the center of distant galaxies. We were sad to see Steve Ritz leave NASA in July. As project scientist he has overseen the development of all aspects of the GLAST/Fermi mission from before launch and guided the transition into the smoothly operating mission that we have now. I am daunted to be filling such big shoes. Happily, Liz Hays has has joined Dave Thompson, and Neil Gehrels as Fermi Deputy project scientists so we remain at full strength. We are looking forward to continuing this blog to share mission highlights, science results and interesting operations tidbits. Author Julie McEneryPosted on August 4, 2009 Tags General12 Comments on A full year of sky survey observations! GLAST First Light and a New Name! We had our first-light press teleconference this afternoon. You can find the information and the slides here. The gorgeous full-sky image, based only on about 95 hours of the first engineering data is shown below, and here is a link to higher-resolution versions (with annotation and without annotation). Because we look in all directions, it’s a bit challenging to map all those directions onto a flat screen or piece of paper. The image you see is an unrolling and flattening of the whole sky. If you prefer to see the whole “globe”, there is a movie here. That bright band is our own milkyway galaxy glowing brightly in gamma rays. The brightly flaring object billions of light years away, 3C454.3, mentioned in the previous post, is the bright source in the lower left side of the image. This is what we saw just opening our eyes and taking a first glimpse of the universe with this wonderful new facility, and it is comparable with the image that took years to make with the previous instrument, EGRET, on the Compton Gamma-ray Observatory. Here is one way to think about this: the advent of air travel enabled the crossing of a continent in just a few hours, instead of many months by wagon, and that fundamentally changed our culture. By analogy, I hope you can get a sense of what this new facility means to us! It took many people from around the world working together to produce this image. I will include remarks from some of them in future posts, along with more perspectives about what the images mean to us and what we are learning. Enrico Fermi (1901-1954) was an Italian physicist who immigrated to the United States. He was the first to suggest a viable mechanism for astrophysical particle acceleration. This work is the foundation for our understanding of many types of sources to be studied by NASA’s Fermi Gamma-ray Space Telescope, formerly known as GLAST. Fermi is most noted for his work on the development of the first nuclear reactor and for his major contributions to the development of quantum theory, nuclear and particle physics, and statistical mechanics. He was awarded the Nobel Prize in Physics in 1938 for his work on induced radioactivity and is today regarded as one of the top scientists of the 20th century. In addition to his direct connection to the science, Fermi holds special significance to the U.S. Department of Energy, the Italian Space Agency, and the Italian Particle Physics Agency. The “f” is an abstraction of a black hole system with an accretion disk (swirling matter falling into the black hole) and emerging jets of very high-energy particles, which emit gamma rays. This is one of the key topics for us to study with the new data. Please pardon the one-month hiatus of this blog. It’s been an intensely busy month, and the early checkout phase is now complete. The first year of science operations has started, and GLAST is surveying the gamma-ray sky! detection by the LAT of two extraordinarily bright, flaring sources. The LAT team circulated notices to the astronomy community (linked here and here.). These sources are very likely supermassive black hole systems at the cores of active galaxies, far across the universe yet incredibly bright. Given that these detections were made with just the engineering data observations, the future is full of promise, and we are very excited. routine detection of gamma-ray bursts by the GBM. See, for example, this story. GBM public data releases should start later this month. using information from radio telescopes, the LAT very quickly saw well-known gamma-ray pulsars, proving that the whole precision timing system works as expected end-to-end. More details about some of these in upcoming posts. In the meantime, you might enjoy looking at the slides from conference presentations by LAT collaborators Richard Dubois (from SLAC) (Richard’s talk is linked here, please scroll down to Richard’s talk, given on Friday at 10:55, and click “download”) and Isabelle Grenier (from CEA Saclay and University of Paris Diderot) (Isabelle’s talk is linked here). At the end of August, there will be a formal release of the first-light images. At that time, NASA will also rename the observatory. Please check back regularly for updates. Early operations continue to go remarkably smoothly and according to plan. The GBM spent the week doing on-orbit calibrations and setting up the automatic onboard system that maintains the calibration. The LAT team was very busy tuning up the instrument and doing detailed data checks. Data taking and processing are becoming routine. Soon! The first-light images will be released in just a few weeks, when NASA also plans to rename the observatory. Arrangements are being made now for this event, which we expect will be at the end of July or in early August. I’ll post the date when we have it. In the meantime, the LAT has now posted single event displays, which show the detector information in graphical form. These are really beautiful!! It takes some time to learn how to read these pictures. First, as referenced in previous posts, please see a brief description of the LAT and how it works. Particles traverse the LAT many thousands of times every second, and the information reported by the sensors about that particle’s interaction in the LAT is called an event. Notice that the charged particles in the events linked above are detected with very high efficiency in every layer. Now, realize that the tracking detector has about 880,000 individual sensing strips and yet they are not registering anything where charged particles are not passing through them. Like the dog that didn’t bark in the famous Sherlock Holmes story, this is profoundly important: the noise is remarkably low, while the detection efficiency is very high. Remember, the LAT takes “pictures” one particle of light (photon) at a time, and since we measure the incoming direction on the sky (as well as the energy and other information) for each, those photons can be added together over time to form an image of any part (or all) of the sky. You’ll start seeing these in just a few more weeks. The event pictures linked above are just one representation of the beautiful performance of the instruments. The LAT tracking detector was designed and built by a collaboration of scientists, engineers, and technicians from institutions in the United States, Italy, and Japan. The charged particle sensors in the tracker were all built in Japan, and they are truly remarkable. About 70 square meters of these precision sensors (called Silicon Strip Detectors, or SSDs) are onboard the LAT! Without them, GLAST would simply be impossible. Here is a note from someone who was deeply involved in the design and production of the SSDs. Prof Takashi Ohsugi, from Hiroshima University, is one of the key GLAST collaborators in Japan. He and many others there are also looking forward to doing science with GLAST. A major Japanese newspaper and some web news sites in Japan covered the GLAST launch. It was a very exciting day for us! We are preparing an article for the monthly report of Astronomical society of Japan (The Astronomical Herald). A special seminar is planned in Hiroshima University to make a more detailed briefing of the GLAST project and science for students and university staff. To connect the breakthrough observations expected from GLAST with what is known about the universe in other wavelengths, coordinated “multi-wavelength” observations wordwide are important. In Japan, the staff of the KANATA telescope (1.5m optical, near-infrared telescope) will start a photo-polarimetric monitoring of some bright blazars for GLAST. More details about the calibrations, observations, and getting ready for the first year of science operations. Please check back for updates. Thanks, also, for your comments! Greetings from SLAC. This week I am here at the LAT Instrument Science Operations Center with many others from the international LAT team, all working together around the clock to study the detailed engineering data and to prepare for science observations. What has GLAST been doing lately? Everything continues to go very well and the work is proceeding on schedule. The LAT is an advanced particle detector with many adjustable parameters to tune, and for the past few days data have been taken with different values for many of those key parameters. In addition, special data-taking periods are being devoted to characterizing the fluxes of background particles hitting the instrument. The very detailed work is going smoothly. The additional diagnostic data taking is keeping the onboard temporary data storage (solid state recorder, or SSR) and data transmission paths well exercised. Over time, the data rate from the LAT will be reduced to the planned science operations level of about 1.2 megabits per second. The observatory is powered electrically by solar panels that also charge an onboard battery. The battery is important because during every 95-minute orbit GLAST spends some time in earth’s shadow (night time for GLAST). Engineers in the Mission Operations Center at Goddard made adjustments this week on the rate at which the powerful solar arrays are allowed to charge the battery, based on operating experience. These adjustments will help ensure a long life for the battery. Soon we will have a first look at the sky with the sharpest ‘gamma-ray glasses’ ever built! A sky that will at last appear as magnificent at the night sky we can admire with our naked eyes, filled with thousands of gamma-ray stars and barred by the bright shades of the Milky Way. But we will see a much more lively and tumultuous sky than the peaceful starry nights we are accustomed to. Intense flashes will last seconds to hours and many stars will blaze and fade away over days and months. A sky showing us how animated the Universe can be, how powerful too, with many objects capable of producing particles and light of incredible energy. Looking back at the successes of the previous telescopes that had discovered a handful of gamma-ray sources in the seventies, tens of them in the eighties, two hundred in the nineties, the team is preparing to detect thousands of them with GLAST. The task is complex because they appear on top of the bright emission from the clumpy nebulae of the Milky Way. It is equivalent to seeing small sail boats lost among big waves during a tempest: a small error on predicting the surface of the rough sea and we miss the tiny sails. We unfortunately don’t know so well our own galaxy and it impacts our ability to detect point sources. The team then needs to identify in other lights (radio to X rays) what black holes, neutron stars, supernova remnants, or binary stars are responsible for the gamma-ray sources. This is also a challenge because bright gamma-ray sources can be very faint in other lights and because the sky can be very crowded compared to the precision with which we can locate a source in the sky. It is often like looking for a needle in a haystack, even if the needle is as weird an object as a giant black hole! 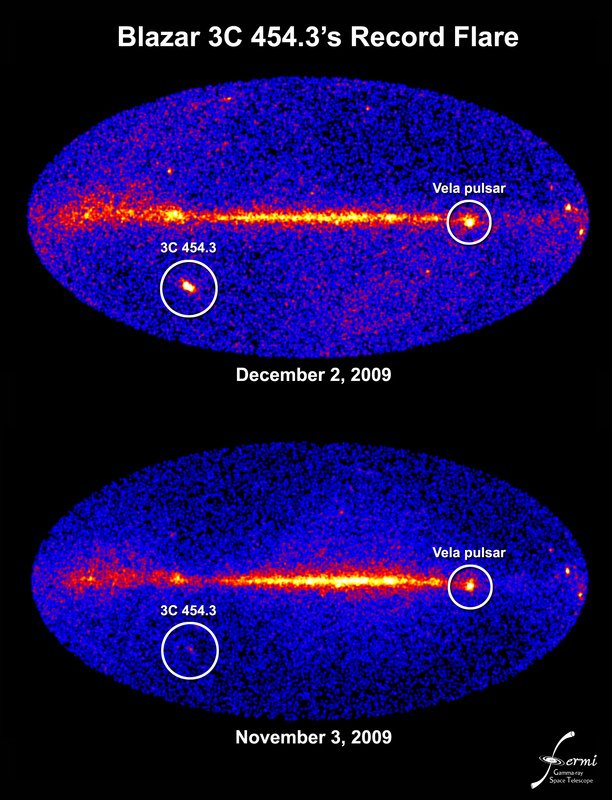 It took twenty years to identify the second brightest gamma-ray source, Geminga, with one of the nearest and faintest pulsars. Half of the currently known sources has remained unidentified for 17 years. We all hope that GLAST will solve those mysteries and replace them with many new surprises. For the moment, we look eagerly forward to the avalanche of new sources. More details on instrument tuning and performance, checking the alignment of the LAT with the spacecraft, observatory maneuvers, and more reports from some of the international team members. Please check back every few days for updates. Today was one of the best days yet for GLAST. Overnight, the LAT high voltage was turned on, completing the instrument turn-on sequence more than a day early. Around sunrise, the LAT started physics runs. This was our first chance to use the LAT to detect high-energy particles from space — and everything just worked beautifully! Data were shipped to the ISOC at SLAC (see previous posts) and processed quickly. Just having the data chain work end-to-end without significant problems was a great accomplishment, and it was thanks to all the detailed rehearsals. LAT scientists around the world then examined the data, and so far everything looks even better than we expected. Initial estimates of backgrounds indicate they are at a very manageable level. There are some minor details in the instrument diagnostic data (this tells us how the instrument itself is working) we don’t yet understand, but we will soon. More about all this in future posts. There are now many days of work ahead to tune, configure, and calibrate the instrument, and we are well on our way. This evening, the GBM turned on its high voltage, and it is also now operational! After about a week of testing and calibrations, the GBM should be ready to start looking for gamma-ray bursts. More about this as well in posts over the next few days. Everything looks good, and the GBM team is also very happy. Overnight, the observatory will transition from pointed mode (always looking in one direction) to sky survey mode: every two orbits (three hours) the LAT will sweep its field of view across the entire sky. This is the primary science observing mode, so it is an important mode for tuning the instruments. Here’s an interesting site to check if you’d like to know where your favorite satellite is at the moment. We had a small celebration in the Mission Operations Center toward the end of the day. We didn’t pause long, though, since there is much more work to do before we can start routine science operations. However, none of us thought we’d be this far along so quickly. Another great day for GLAST. The turn-on of LAT components went much faster than the nominal plan. At this time, all the electronics in the LAT have been powered on (LAT has about one million channels of electronics, plus three onboard computers that are part of a sophisticated data gathering system — all of it running on <650 Watts or about half the power used by an ordinary hand-held hair dryer), and everything looks good so far. We could not be happier! The next step tonight will be to turn on the high voltage to the sensors in the anticoincidence detector (see below for links to information about the detectors), and tomorrow morning the LAT will start detecting individual particle events, at least 1-2 days ahead of schedule. The fluxes of high-energy charged particles in space are surprisingly uncertain, and we expect it will take the next few weeks to tune the LAT to operate in its new environment. The `rain’ of high-energy charged particles through the LAT (many thousands of particles per second) is much larger than the rate of celestial gamma rays (just a few per second), so the name of the game in gamma-ray astrophysics is background rejection — the detective work to identify the gamma rays. The LAT design is very well suited to this task, of course. Some of you have asked for pointers to more information about the detectors. Thanks for the suggestion! The Stanford University LAT page has a link to a brief description of the LAT subsystems, and there is also this description on the Mission site. Please also have a look at the introductory posting for this blog. Even more detailed information can be found on the SLAC LAT Project Website. Tomorrow, the GBM will also turn on the high voltage to its sensors. In other words, by the end of the day tomorrow both GLAST instruments should be operational. As I was leaving the Mission Operations Center this evening, the lead engineer for the spacecraft commincations system asked me how I was feeling. `Grateful and very lucky’, I said. He replied we have a great team of very hardworking people, and that is why things have been going well. He’s absolutely right — but I still feel very lucky, too.